Greed, fraud, and corruption within Big Pharma and the FDA are the constructs of deception, with the mantle of authority leading to over 100,000 American deaths each year from correctly prescribed FDA approved pharmaceutical drugs. And that doesn’t include those who are sickened, needing more medications from side effects, hospitalization, or years of rehab for crippling adverse “side effects.” Nor does it include the effects from over-the-counter (OTC) drugs that lead to an almost equivalent number of casualties as their prescribed counterparts. The FDA-Big Pharma partnership scheme calls for long trials involving cruel animal testing and testing on humans with their placebo control groups. The real problem is that the pharmaceutical companies pay for all this and conduct the trials themselves. This expense keeps effective, safe natural medicines from private individuals and small providers out of the FDA approval loop. The big boys make their own reports for FDA approval, often paying ghost writers to create favorable medical journal reports that medical professionals sign off for a significant fee. Then Big Pharma pays the FDA a fee for approval. And to top it all off, many FDA “consultants” are Big Pharma insiders with financial ties whose careers depend on that big corporate/government revolving door. All of these situations are corrupt signals. An FDA approved substance is a deception that leads most everyone to think the drug they’re taking is safe. But even if taken according to instructions, that’s probably not true. ”Evidence based medicine” is the arrogant assertion while accusing alternative healers of fraud or lacking science. But what do they consider scientific? Large scale studies reduce people to improbable statistics. Here’s an example: A shoe company in NYC surveys the foot sizes of 10,000 men, women, and children. Then they take the average size, make all their shoes that size and market them throughout the country. One size does not fit all. Also, the magnitude and expense of these large studies preclude repeating any tests. But scientific methodology requires the ability to repeat an experiment with the same results. Another aspect of Big Pharma’s reportage includes good editing. Adverse effects, non-efficacy situations, can and are often left out. Long term studies on humans are shunned. The FDA doesn’t bother investigating until well after marketing and large real-life casualties and lawsuits pile up. 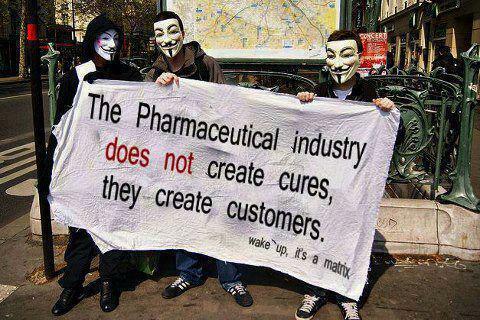 By then, the pharmaceutical companies have made their money. Actor-comedian George Burns once said, “The secret of acting is sincerity. If you can fake that, you’ve got it made.” Faked sincerity from pompous authoritative positions is what the Medical Mafia uses to promote their lies to a naive public or attack alternative systems of healing. Researchers and research universities are financial beneficiaries from large scale studies. Alternative methods for treating cancer have more living proof, which is documented, of efficacy and safety than anything Big Pharma has created for its lost war on cancer. Natural healing modalities were first based on scientific investigative analysis, which was then repeated consistently with greater success among actual patients with virtually no adverse effects. It’s common for many alternative healers’ documents proving efficacy to be stolen or burned. Large vested medical institutions routinely test their protocols incorrectly to “prove” they don’t work or simply lie outright. Independent studies from smaller, alternative sources are consistently refused from medical journal publications. Medical journals don’t make nearly as much money from underfunded resources as they do from Big Pharma’s glossy ads. These are the rotten fruits of a profit motivated medical system and media that deceptively rules modern medicine with both cunning and an iron fist, and the mainstream media complies to maintain its pharmaceutical advertising revenue. Worshiping authority blindly is one of mankind’s greatest weaknesses that is leading to self-destruction. Credits: Waking Times. Used here with permission.